“A little girl sees a shiny new bicycle in the shop window. She hurries home to see if she has enough money in her piggy bank, but when she comes up short, she knocks on the doors of her neighbors, hoping to do their yardwork. They all turn her away except for a kindly old woman. Like the Farmer and the clown that I wrote about a week ago, this is a wordless picture book that reads very much like an old black and white movie. 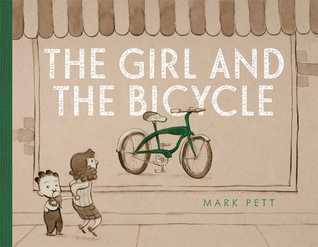 The drawings in this are really interesting, they are drawn in varying shades of brown and grey – the only colour being the dark green bicycle. The book is overlaid with a real feeling of sadness. It is unusual in that most of the characters are drawn without mouths – so it is impossible to see their facial expressions. The absence of any smiles makes it really sad. The kindly neighbour is the only smiling adult we see and it is lovely to se the bond that develops between the girl and the neighbour as they work together through the seasons. Readers will really feel for the girl when after she has worked so hard, and all the money is saved, she discovers the bike has been sold. The ending is very satisfying and says a lot about giving and gratitude. Another great book to use as a writing prompt. Published by Simon & Schuster Books for Young Readers, 2014.